Photo found on Flickr.com courtesy of Blackstarjewelry. A compost pile is just simply what the name implies: a pile of compost that may or may not be covered with a tarp that sits on your lawn and decomposes until it is sweet, rich, compost ready for your lawn or garden. However, some cities do not allow compost piles because they can be unsightly, and they can attract pests if they are not constructed and maintained correctly. So you may have to check your local city ordinances to see if a compost pile is kosher with the city (or in some cases, your homeowner’s association if you have one). 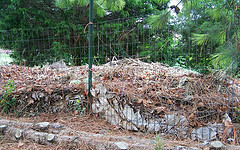 If a compost pile is allowed and you still desire to create one then great – you are in the money. 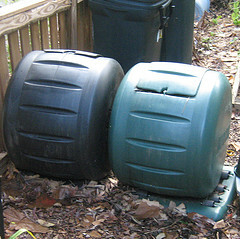 If one is not allowed or if you are considering other viable options – a compost bin may be right up your alley. Photo found on Flickr.com courtesy of TroyJunkinStuff. There are numerous styles and types of compost bins – from tumbling compost bins, to recycled plastic compost bins, to homemade compost bins, to even multi-bin systems that can fit with ease in your backyard. These are amazing and very helpful, because they can still get the job done with ease. If your city has an ordinance pertaining to compost piles in your yard, having a bin can essentially bypass said ordinance, but still allow you to produce rich compost for your lawn. So do not fret if your city ordinance does not allow a compost pile – with a compost bin, perfect compost is still highly attainable for your lawn, crops, and garden. Don’t miss our other post about how to make a compost pile.